Canada isn't all maple syrup and ice hockey, you know. We've got monsters too, and Ian Rogers is a guy who knows how to shine a spotlight on them. I've already been entertained by the first two novellas in his Felix Renn series through Burning Effigy Press, so I was interested to see if Black-Eyed Kids would make it a trifecta. If you haven't read my reviews of the first two books, which I posted on this blog, you can check those out by clicking on the links: Temporary Monsters and The Ash Angels. One of the nice things about this series though, is the fact that you don't necessarily need to read the first two to hop on the bandwagon. You could start with the third and get caught up with the main story points in short order. This time around, Felix is doing some work in Toronto that is much more mundane and far less life-threatening--for a while, anyway. He's been hired by a guy to keep an eye on his wife whom is suspected of being unfaithful, but while Felix has her apartment staked out she is murdered right under his nose--cut in half with the lower half missing, and there's no sign of anyone coming or going. It doesn't take long to realize there is something supernatural going on, as that sort of thing seems to just gravitate to ol' Felix. A big clue that things are on the paranormal side of things is when two kids, a boy and a girl, begin stalking him. 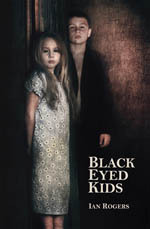 Maybe not so disturbing when put like that, but these kids are Village of the Damned caliber creepy thanks to eyes that are orbs of pure black. When Felix finds out the kids are connected to the murder, he also learns the guy who hired him isn't who he says he is, and there's been more than one death linked to those kids. Whoa Nelly, this one was a dark treat to read. The first two books certainly had their fair share of sinister vibes, but there was more--how do I put it?--rollickingness. No that's not right. Maybe sardonic tone is what I mean. Felix is the kind of guy who will let his world-weary side shine through. This time around there isn't a lot of room for that, because his life is in imminent danger even more than the last two times. The story is the most intense of the three with a threat that Felix comes to believe he can't defeat. Everything plays out really well with an episodic quality I've come to expect and appreciate from Ian's work. I think this would have to be Ian's strongest effort yet of the three novellas published so far, which bodes well for future iterations, including a Felix Renn novel that's apparently in the works. If you enjoy gritty urban fantasy, this should be right up your alley.